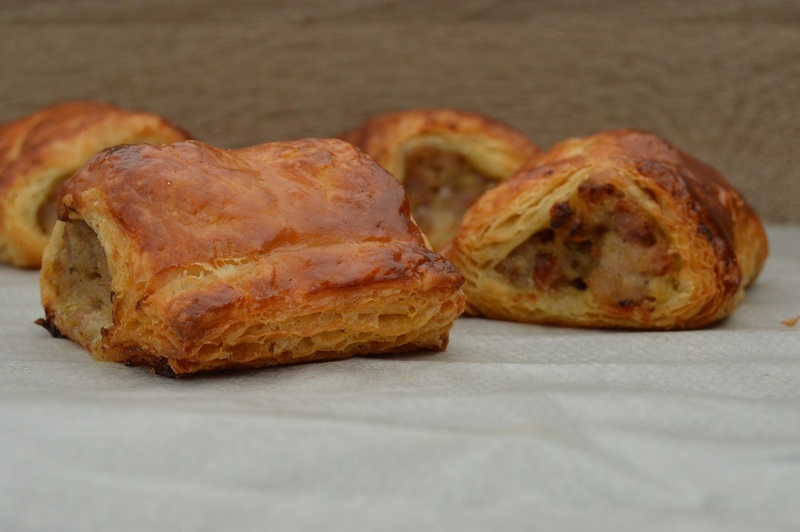 For me, a sausage roll is truly one of life’s simple culinary pleasures. As long as it has a generous, well-flavoured filling and a crisp, buttery pastry, I can eat one (well, several!) at any time of the day or night. This recipe is my homage to my gran’s terrific pastry skills, as she would make these decades ago, and first got me into making pastry and cooking in general. 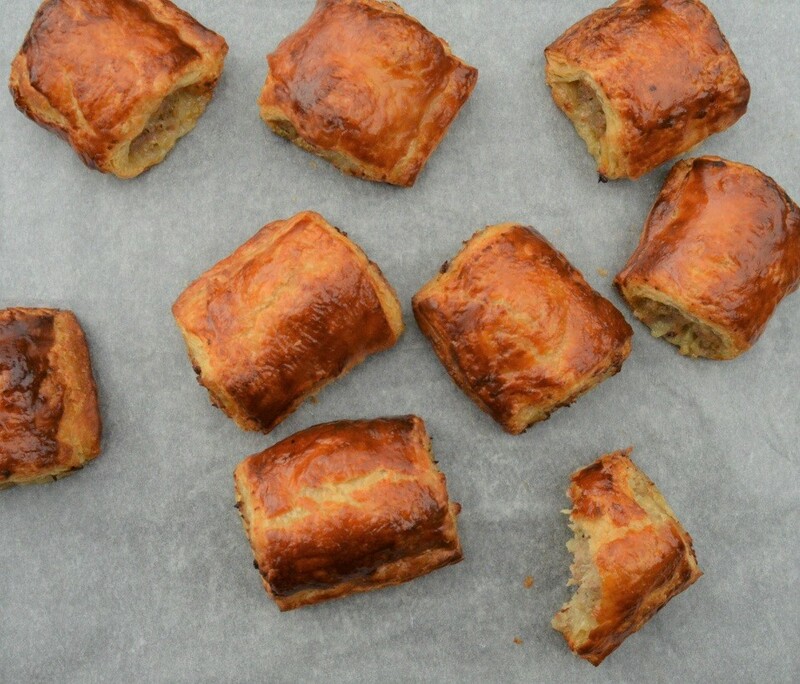 These are essentially a variation of the sausage rolls that I have been making for decades, just with croissant dough for the pastry. These croissage rolls, as they are referred to in my house, are slightly more substantial than sausage rolls made with puff pastry, but they are not at all heavy. 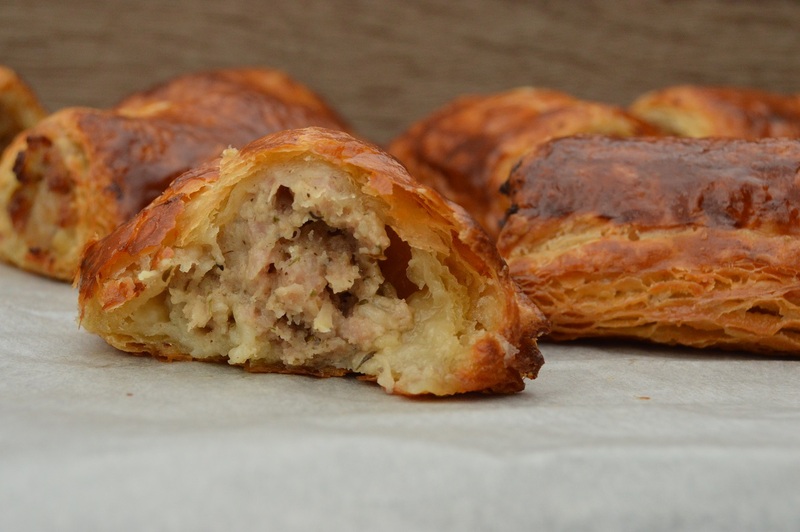 The croissant dough adds more body to proceedings, but still has the lightness you want in a sausage roll. Think a cross between a normal sausage roll and a sausage sandwich! The recipe for quicker croissant dough gives excellent results and is very easy to make. I would steer clear of the pre-bought croissant dough in cans as they have no flavour and give rather under-whelming results! 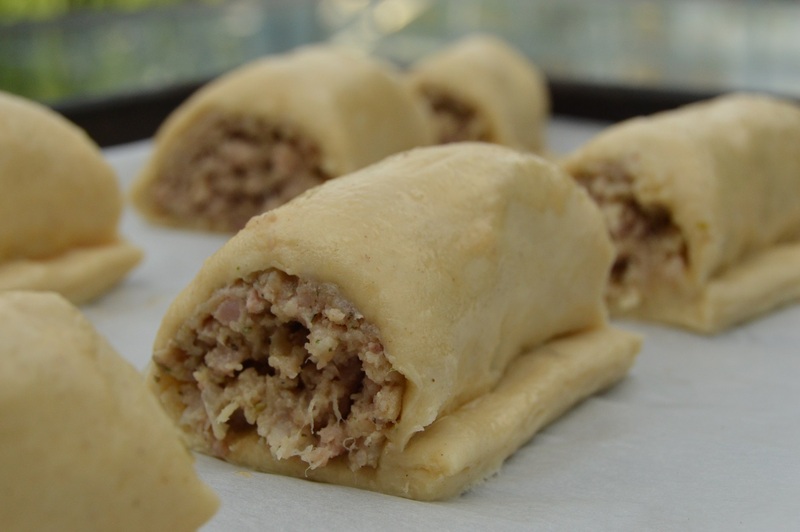 The rolls can be frozen once the cooled sausage filling has been wrapped in the dough: then simply take what you need from the freezer the night before, put them on baking trays and cover. By the morning they will have defrosted and risen, and will be ready for baking. (1) Mix together the sausagemeat, Cheddar, onion, apple, chutney, herbs and seasoning: you can fry off a little of the mixture to check the seasoning and the overall flavours are as you like them. (2) Taking a few handfuls at a time, compact the meat and roll into thin sausages. Bake for about 5 minutes in an oven preheated to 180C (fan): this will partially cook the sausagemeat. Leave to cool. NB: without this partial pre-cooking, the meat doesn’t quite cook enough in the shorter time a croissant dough takes to bake compared to puff pastry. (3) Roll out the dough to a rectangle that is just over 60cm by 24cm, trimming the edges if necessary. Make a cut lengthways through the dough with a sharp knife, giving two rectangles of size 60cm by 12cm. (4) Spread a little mustard over the each piece of dough and place the cooled sausagemeat down the centre of the dough. Roll up and pinch gently along the seam to seal the dough edges together. You can either put the seal underneath or leave it as it is. (5) Brush all over with the beaten egg. Cut into pieces of whatever size you prefer. (6) Place on baking sheets lined with greaseproof and pop in a large plastic bag. Leave at room temperature to rise until the dough is puffy and almost doubled in size: this can take up to a couple of hours, depending on the room temperature. (7) Brush again with egg and bake in an oven preheated to 190C(fan) for 15-20 minutes until golden brown, turning down the temperature to 170C after 10 minutes if they look as if they are going too dark. looks absolutely amazing… now, can you believe I’ve never had a sausage roll??? Oh I hope you enjoy them. they are great fun to make and taste to good…….moreish! !